The above info came from AnimeDude800, and was edited by yours truly (contact me). The image came from Inuyasha!. 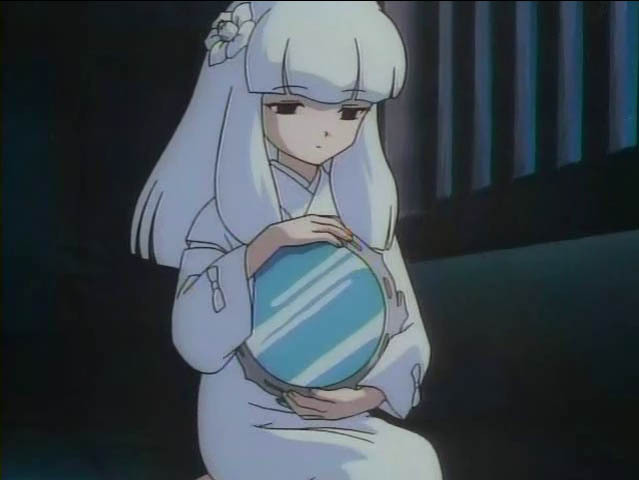 Kanna is the first of Naraku's detachments, but the second to be seen. She carries around a mirror that can steal human souls and reflect attacks. She is quiet and very stoic, showing almost no emotion. She is resigned to the fact that she is nothing more then Naraku's tool and does not try to change it like her sister, Kagura. Kanna kills herself following the orders of Naraku. The above description came from AnimeDude800, and was edited by yours truly (contact me).